Due to the current situation of Andress Bautista and his wife Patricia Paz Bautista a new game was created by Rovio Entertainment. 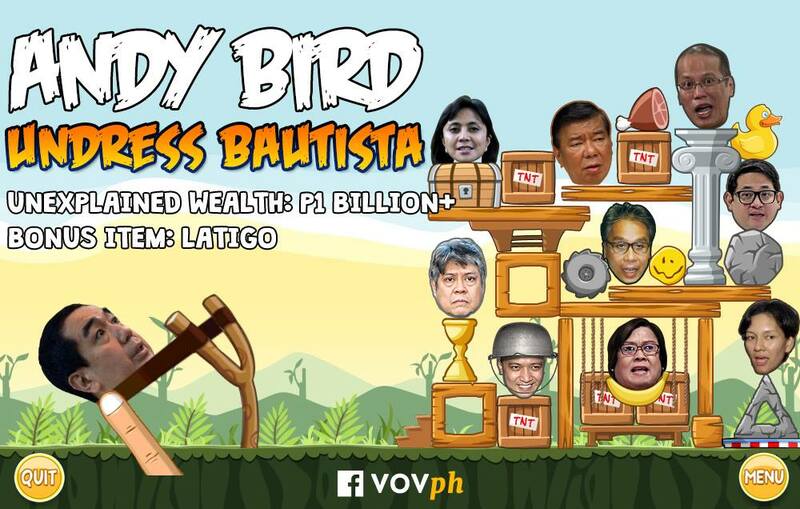 This time a new game called "Andy Bird" will be released and Tagalog will be available as a language setting. The new game would feature Andy Bautista, Leni Loud Robredo, Franklin Drilon, Nobita Aquino, Kiko Pangilinan, Marbobo Roxas, Bum Aquino, Antonio Trollanes, Leila Dilemma and Risa Hontivirus as possible players. The designers Jaakko Iisalo, Markus Tuppurainen and Peter Urbanics all showed a demonstration of the game. So far, the game is still under development it will be launched on September 21, 2017. So far, a lot of people are anticipating to play this game. The game's plot involves Bautista's hidden wealth which he must defend.